At FACE/OFF we will finally see the much-anticipated match between “Ruthless” Ruy Batello and the Lumberjake, as the former tag team partners collide after months of Batello ducking his former friend and partner. The two nearly came to blows September 5th at FALLOUT but officials, his BFF Mike Paiva, and a slew of NCW wrestlers ensured Jake wouldn’t lose his chance to wrestle Ruy if he laid a hand on him prior to their scheduled encounter September 26th. In Norwood one rivalry will be put to rest for good when the two time NCW New England Champion Rob “The Giant” Araujo goes up against the uncrowned champion “Simply God’s Best” GA West in a thirty minute Iron Man Challenge, with the winner going to the man with the most falls within the half hour timeframe to become the undisputed NCW New England Champion. Also on the 26threigning NCW Tag Team Champions the Underground Anarchy (“Slamdance” Tim Lennox and “Bam” Brandon Behm) along with their manager “Black Magic” Sean Feeney have challenged the NCW Heavyweight Champion “RIOT” Kellan Thomas to an eight-man Total Elimination Match at FACE/OFF, with the trio announcing their fourth man the night of the event. Feeney was furious with the NCW Champion after Thomas and friends ‘attacked’ him following the action at FALLOUT. After feeling slighted by the NCW Championship Committee the Underground Anarchy has decided to take matters into their own hands at FACE/OFF. 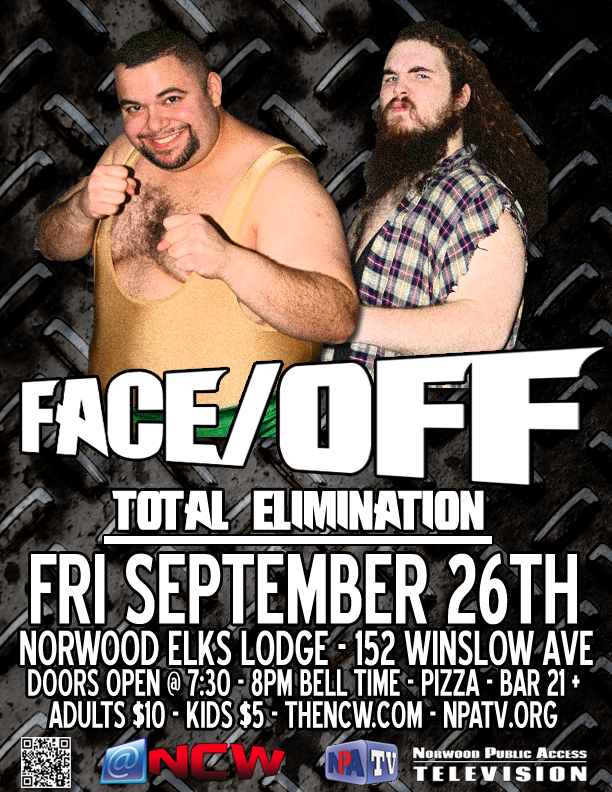 Also appearing in Norwood on September 26th will be “The Native American” Tomahawk, “Dastardly” Doug Summers along with Ashley Vox going one on one with the Deputy Commissioner of NCW Richard Pacifico, the Loomis Brothers, Triplelicious, Steve “The Turtle” Weiner, NCW Commissioner Dean “The Beast” Livsley, and more! The Norwood Elks Lodge is located at 152 Winslow Avenue in Norwood, Massachusetts. Doors open at 7:30pm with an 8pm bell time. Tickets will be available at the door only $10 for adults and $5 for all kids twelve and under. For more information on Northeast Championship Wrestling be sure to visit us online at http://theNCW.com and follow us on Twitter @theNCWtweets. NCW Television also appears weekly on Norwood Public Access (http://www.npatv.org), be sure to check your local listings for times!